You probably didn’t know that tomorrow is World Alzheimer’s Day—I certainly didn’t. And you probably weren’t aware of the recently released report, “World Alzheimer Report 2015: The Global Impact of Dementia—An Analysis of Prevalence, Incidence, Cost, and Trends,” released last month, since it wasn’t mentioned in the NY Times or the Washington Post or the Wall Street Journal. The only reason I know about it is that I happened to see it mentioned when I was scanning the prominent British journal, the Lancet, looking for something to write about in this blog. 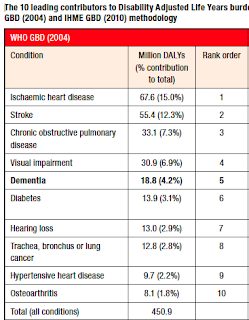 The British seem to be far more attuned to global health than we in the US: for example, they spearheaded the “Global Action Against Dementia” G7 conference held in Geneva in May, 2015. So what exactly did the new report have to say? Worldwide, there are now an estimated 46.8 million people with dementia. In sheer numbers, that translates to 9.4 million in the Americas, 10.5 million in Europe, 4 million in Africa, and 22.9 million in Asia. The doubling time for this relentless, progressive, degenerative brain disease is approximately 20 years. Most of that growth is due to population aging—the forecast assumes that the incidence and disease duration will remain unchanged. What is most striking is the shift towards low and middle income countries (what the cognoscenti call LMICs): right now 58% of the world’s demented people live in that part of the world; by 2050, the prediction is that 68% will. What can we do about this? What we can do is a reflection of the reality that dementia is as much a social issue as a medical one. 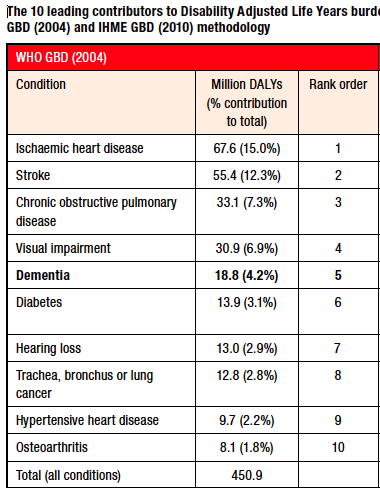 In fact, only 20% of the $818 billion price tag associated with global dementia care today is for direct medical care; another 40% is for social care (nursing homes, personal care assistants, etc), and the final 40% is for informal care. But most of the lower and middle income countries do not have the infrastructure needed to care for the increasing numbers of older people with disabilities of any kind, including dementia. They don’t have the long term care institutions, the community organizations, or the assistive devices they need to provide a decent quality of life to the afflicted and support for their families. Global aging in general and the dementia epidemic in particular demand our attention. The US can take the lead: in biomedical research, with the goal of developing treatment for dementia, in bioengineering, with the aim of designing technology to assist in the care of those with either physical or cognitive disability, and in social research, to provide the systems and the strategy needed to maximize the quality of life both of patients and their families.